Fresh oysters on the half shell at home are great—unless you’re the shucker. Then fresh oysters on the half shell at home means exhausting, messy, potentially injurious work. We have a solution: For super-easy oyster prep, just chuck them on the grill. Fresh oysters on the half shell at home are great—unless you’re the shucker. Then fresh oysters on the half shell at home means exhausting, messy, potentially injurious work. We have a solution: For super-easy oyster prep, just chuck them on the grill. The shells will pop open when the oysters are done. Here, six buttery, briny recipes for grilled oysters. Chef Bobby Flay tops his oysters with a blend of butter, tarragon and hot sauce. 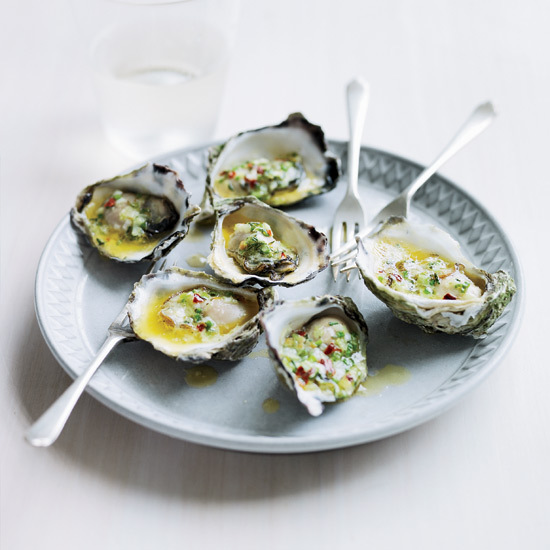 The perfect party snack, these oysters are drizzled with tequila-spiked spiced butter. The tangy butter in this surf-and-turf-style recipe is studded with spicy chorizo. Sweet, melted leeks are delicious with plump, smoky oysters. Fennel fronds give the butter in this recipe a delicious freshness.